Our unit provides the best services to our guests. 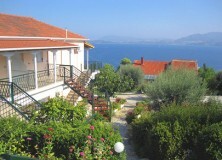 The complex is located in Nikiana, 8km from the town of Lefkada and 70m from the sea. The lush green environment which our unit is established will relax you from the beginning in order to enjoy your holidays in the beautiful island of Lefkada. We wish you to spend a memorable leisure time in the unique Lefkada. Our unit facilitates 8 studios and 6 rooms (double) all with air-condition, tv, free wi-fi and parking. Studios have: Fully Integrated Kitchen, Air – Condition, Bathroom with Shower, TV, Balcony with View, & wi-fi and Apartments (Double) have: Air – Condition, Bathroom with Shower, TV, Balcony with View & free wi-fi.